At our Bulimba family dental office, we’ve taken added steps to provide you with state-of-the-art oral health care. Our in-house dental lab located at our Mt Gravatt location is one such example. 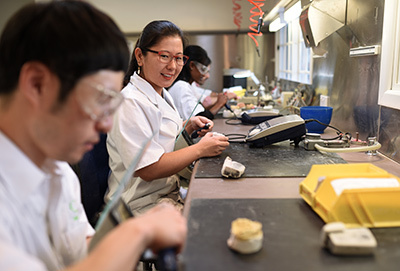 Thanks to on site dental technicians, we’re able to handcraft precisely designed restorations that are customised to the unique needs and concerns of our patients. Each of our registered dental technicians work with the highest quality of biocompatible materials, ensuring the best outcome for your oral health needs. When you’re having crown or bridgework completed, the fact that we have an in-house lab helps us to reduce the overall cost of your treatment. Plus, we’re able to work more efficiently because no impressions or models have to be sent off-site. This allows us to work quickly without sacrificing the integrity of your care. When you need to be expertly fitted with a permanent restoration, our lab technicians are able to work side-by-side with our dentist to create crowns or bridges that are of the highest quality and fit. Custom shade matching and design is all done on site, completely eliminating any guesswork that would take place if we used an off-site laboratory. Your older family members can arrange for us to pick them up at their residence or nursing home, to be fitted with dentures or make repairs. Our courtesy car pickup is available free of charge; you need only call and ask! We’re open late and on Saturdays. Schedule your appointment today! We look forward to helping you achieve your oral health goals.